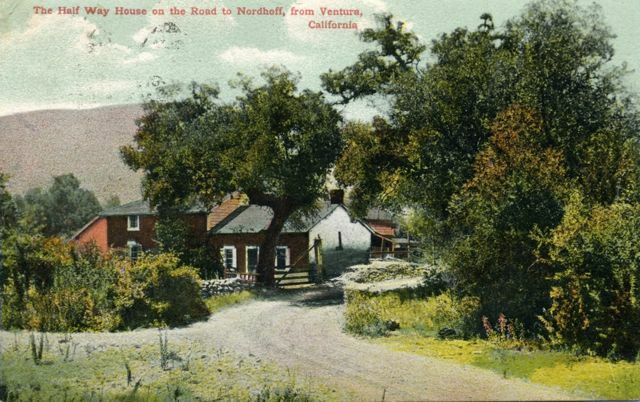 The present Rancho Arnaz, now known for its apple orchards and apple juice, surrounds the old adobe ranch home of Don Jose de Arnaz. It is but a small part of the original 21,522 acres of land once owned by Arnaz. The Province of Santander, Spain was the birthplace of Arnaz, but by the time that he had reached his 16th birthday in 1837, he left his Spanish home and set out on an adventurous journey to see the world. His first stop was Havana, Cuba. In 1841, he arrived in California aboard one of the merchant ships that would come to furnish the inhabitants with clothing, jewels, sugar and brandy in exchange for hides and tallow. Soon after coming to California, Arnaz opened a general merchandise store in the pueblo of Los Angeles. It was a year later that he first came to San Buenaventura on a visit and, having enjoyed himself in the new surroundings, he made plans to settle there. Arnaz was highly educated and destined for leadership in his new home. Through his early years of education, he had received a medical degree before starting out to see the world. What he found in the new country was a great need for a physician. Prior to his arrival, the only administrators to the sick were the Franciscan missionaries. Over the years, he gave of his services to the sick and furnished medicines when he could, never taking a cent for his labors. Arnaz, as an aristocrat in manner and appearance, and then as a public benefactor, received an immediate high standing in the community. With the many new opportunities to acquire property, he became a large landowner – his holdings not only being in San Buenaventura, but also in various other parts of the state. At one time, he even held title to an island in the San Francisco Bay known as Yerba Buena, over which the San Francisco-Oakland Bridge now passes. ?In the small town of San Buenaventura, Arnaz opened the first general merchandise store, even before the county was established. In 1845, he was the lease holder of the Mission of San Buenaventura, having leased the property from the Mexican government for the sum of $1,630 per year. The lease included 1,407 head of cattle, 19 yoke of oxen and 2,158 head of sheep. The orchard at the mission contained 582 fruit trees, one vineyard of 1,510 vines and another vineyard of 3,800 vines. The next year, he purchased the mission property for $13,000. The land totaled 48,822 acres. However, ownership by Arnaz was not recognized during the time that the Mexicans and the Americans were struggling over the possession of California. Once Arnaz had secured the title from the Americans, he sold the old San Buenaventura Mission to Dr. M.R. de Poli. It was while living in San Buenaventura that Arnaz had his dealings with Col. John C. Fremont. Â Fremont had come to be a thorn in the side of the Mexican authorities of California. He came with secret instructions from the Washington authorities of that day to make observations and institute preliminary steps for the seizure of the province by the Americans. As Fremont marched southward from Monterey in the winter of 1846, he found that the Mexicans were waiting for him in ambush at the Gaviota Pass where, at the narrowest part of the pass, men were concealed on the tops of the cliffs ready to roll rocks down on Fremont and his men. Fremont decided to avoid the Gaviota Pass and, instead, traveled over the San Marcos Pass through the Santa Ynez Mountains. Arriving in Santa Barbara after the difficult passage, the American flag was once more raised over the Presidio. Leaving a small group of soldiers in Santa Barbara, Fremont marched the main body of his soldiers southward along the Rincon toward San Buenaventura. News of his coming had preceded him, and there was a mass exodus to the hills. Arnaz, who was responsible for the mission workers, remained at his post. The family residence was just a short distance away, with a pear orchard between the house and the street on which Fremont would be traveling. When Fremont arrived, Arnaz furnished him with fresh horses and pack animals. Fremont gave him unsecured notes for each of the animals, but Arnaz was never able to collect from the American government. The bill was never paid. Arnaz was also a great success in the field of agriculture. He planted the first field of wheat and raised the first crop of lima beans in Ventura County. Arnaz was not only a merchant, doctor and rancher, but he was also an energetic influence in establishing the township, which was incorporated in 1864 as San Buenaventura. Arnaz was also a supervisor from Santa Barbara County, which, at that time, included San Buenaventura. He was also one of the owners of the Santa Ana Water Company. It was about this time that Arnaz acquired his Santa Ana Rancho holdings, a small portion of which is now known as Rancho Arnaz. Besides the adobe Arnaz home, there are other spots of interest nearby. The Arnaz School was built on land donated by Arnaz, and directly across the San Antonio Creek is the spot where Thomas R. Bard lived. Bard came to California to start the oil developments, using oil rights which were owned by Thomas S. Scott, assistant secretary of war under Abraham Lincoln. The Bard house was also used by Scott and some of the officers of his firm and their families. The little house on the mountainside was very picturesque and a landmark of those times. When Bard, who later became U.S. Senator from California, lived in the house, Arnaz was his nearest neighbor. As was the custom of the times, he bought milk and other food supplies from his neighbor, as well as borrowing various articles occasionally. Today, the Rancho Arnaz adobe and cider barn are constant reminders of a bygone era. The buildings have been well-maintained by their owners and each remains a treasured Ventura County landmark. Fremont did NOT intend to go through Gaviota. This is a continuing myth! Hi, Jim. I’ve been trying to research your comment, but haven’t yet found anything to support it. I did find that, unknown to Fremont, the Mexican army had previously withdrawn from Santa Barbara to Los Angeles, and that passage through Gaviota Pass would have been hindered by flooding. But everything I found said his intent was to go through Gaviota. He was guided by local resident William Foxen through San Marcos Pass to avoid Gaviota. Can you send me your reference? I would simply like to know what time of year their apple barn is open, and when or where I could purchase fresh cider. I drive by that barn every day, before and after work and just crave a sip of fresh cider to say the least. Unfortunately I never see the barn open. Uh, hello! Potential customer and many pals here! I am interested in the history of the “pink” house which looks to have been constructed in the 1920’s in the “Gatsby” style. Possibly 3 stories high. I always understood that the “pink house” was Don Jose Arnaz’s adobe.